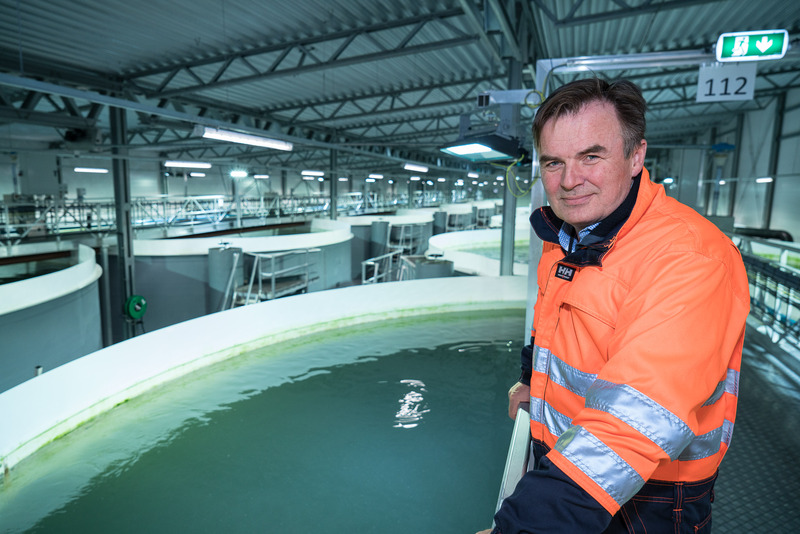 Bremnes Seashore is building recirculating aquaculture systems (RAS) for smolt on land. This is part of a long-term strategy based on a detailed assessment of the future production of salmon with little sea lice. “We have tested many options but are now focussing on land-based production of large smolt. We have converted one of our hatcheries to enable production of fish up to 200 g on land. And now we are building two new halls to produce fish up to 500 g,” says Geir Magne Knutsen. “From our own production, we see that fish stocked as 200 g in the spring tolerate more with less mortality, and achieve the slaughter weight more quickly, than smolt stocked at 100 g. And a shorter time in the sea means a lower risk of sea lice infection,” says Knutsen. Knutsen’s observations in their facilities correlates well with the research done so far at CtrlAQUA. A high degree of control appears to be positive, both in regard to efficiency and the health of the fish. The development of closed facilities on land has taken off with the increasing problems with salmon sea lice, and because regulations now facilitate it. In 2016, permission was given to farm salmon all the way up to slaughter size in facilities on land. “But we are moving into uncharted waters when we produce large salmon on land. So we wanted to join CtrlAQUA to be at the forefront of knowledge, and to collaborate with other researchers and fish farmers who have the same focus as us,” states Knutsen. What do you get out of the collaboration with CtrlAQUA? Knutsen also explains how they want to use the collaboration to bolster innovation in the company. “Even though in a recirculating facility we have control of environmental factors such as temperature, lighting and feeding, the fish are to be released into the sea with naturally varying temperatures. We have knowledge gaps, for example on how to avoid early sexual maturation. By participating in CtrlAQUA, it is easier for us to conduct research on our facilities and to solve the challenges we are focussed on. Originally, the idea was that Bremnes should contribute to CtrlAQUA with semi-closed facilities in the sea. But they decided against that and went for land-based. Knutsen has most faith in land-based for three reasons. He believes that it will be easier to control infection; that it will require less maintenance; and that it will be easier to meet increasingly stringent cleaning legislation. “But not everyone agrees with me. Fortunately, because then several possible solutions will be tested. Whatever the results, I believe that by 2023, quite a large number of hatcheries will be built with the technology that we are now developing,” says Knutsen. And it doesn’t stop there. Knutsen says that Bremnes will evaluate whether in the future it will expand to 1,000 g. So far, NOK 600 million have been invested in the production of up to 500 g.
“I will need to prove my case if I am to get acceptance to expand for the production of 1,000 g on land. But the gains to be realised by cutting down on the production time are so great that I believe it will pay,” states Knutsen.